Check out the updated branch and let me know what you think. 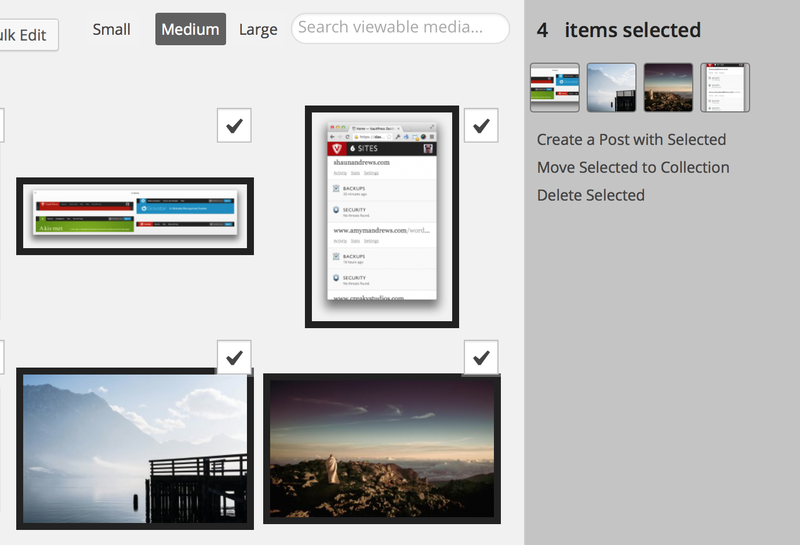 The media modal already has a multiple select workflow for inserting multiple attachments into the post and creating galleries. I think we should leverage this UI as much as we can for cross-UI familiarity. So if a user selects multiple items, we can load up the sidebar as you propose without needing to actively switch modes, and drop the “Bulk Edit” button from the UI. The media modal has a similar convention for selecting multiple items. There are two modes in the modal: insert single item; insert gallery. The flow I outlined above actually follows this convention closely. The UI is different, but thats primarily an effect of the modals completely different layout. The modal uses an “always there” bottom toolbar for showing the selected items. Thats ok when you’re selecting multiple images, but useless when you can only select a single image at a time. The toolbar is useful, since it lets you select images as well as edit their information in the sidebar. I’m suggesting we forgo the bottom toolbar all together on the Library screen. Since you’ll be entering a “bulk edit” mode, there’s less need for editing individual images while also selecting multiple images — this frees us up to replace the bottom toolbar and simply use the sidebar. Less UI.